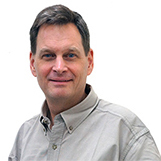 With so many civil engineering software applications available, each with their own proprietary database structures, data interoperability has became a major problem. Over time, engineering consultants and review agencies called upon the industry to develop a standard design data format that would allow for quick and easy data exchange capability from one software application to another. In 2000, LandXML.org led by an industry-driven consortium of partners, came forward to provide a non-proprietary data exchange standard called LandXML. LandXML is a file format that has been developed as an industry standard for civil engineering, land planning, and surveying software. This open data file format is readable by various applications. Because of its non-proprietary nature, LandXML files can be easily imported and exported from one application to another, without relying on any specific vendor and their programs. Using LandXML, you can transfer data from one application to another, archive the project data in a non-proprietary format, view, edit, and report data using web-based tools, as well as adjust the elevation of the data globally. However, when you are exporting or importing data in the LandXML format, keep in mind that you won’t get data in a “ready to go” condition; you have to carefully incorporate drawing information and other features by taking reference from the original drawing. You have to also make sure that software version of LandXML is compatible while importing and exporting. When you are working on MicroStation, specifically MX Roads, InRoads, and GEOPAK, you can import its surfaces into GeoHECRAS using LandXML. GeoHECRAS fully supports LandXML files and importing this format into the software is a quick and easy process. Importing MicroStation surface into GeoHECRAS is a two step process: first exporting the surface into LandXML file format and then importing it into GeoHECRAS. Below are the steps described for importing various MicroStation Surfaces into GeoHECRAS. Open the project in MicroStation with the terrain surfaces you want to export. Select File > Export > LandXML… to export the LandXML file. After exporting the terrain surface as a LandXML file, you can import it into GeoHECRAS. Review this knowledge base article on how to import a terrain surface LandXML file into GeoHECRAS. Go to the InRoads main menu, select Tools > Application Add-ins. From the drop-down list, ensure that XML Report Add-In is checked on. Then you can proceed to exporting design data according to your requirement. From the InRoads main menu, select File > Translators > LandXML Translator. The LandXML dialog box will be displayed. In the LandXML dialog box, click on the Export Surface tab. In the Surfaces area, select the surfaces to be exported. Mark the check-boxes beside Include Triangles, Include Features, and Include Non Triangulated Features, according to your requirement. Next, go to the Linear Units drop down combo box and select US feet. 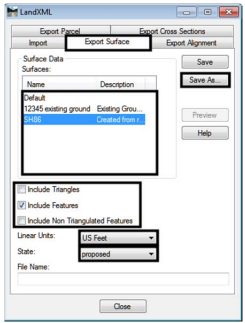 From the State drop down combo box, select proposed or existing to match the surface being exported. Click on Save As. The Save As dialog box will appear. Click on the Change… button and browse to the directory where file should be saved. Fill the relevant details in appropriate fields for Name, File Name, and Description. In the LandXML dialog box, click on the Export Alignment tab. In the Alignment Data area, select the Geometry Project you wish to export. In the Include field, fill in the desired alignment. You can select multiple alignments by using the target button. Please note that you must make the desired vertical alignment active before exporting the file. Next, click on the radio button beside LandXML for the version you want your data to be saved. Check the box beside Include Active Children Only. If checked, it will only include the vertical alignment that is active. If unchecked, it will include data for all the vertical alignments under the selected horizontal alignment. Check the box beside Include All Cogo Points. If checked, it will include all the COGO points in the buffer area. If unchecked, it will only include the points associated with the selected alignment. From the Linear Units drop down combo box, choose US Feet. From the State drop down combo box, choose proposed or existing to match the alignment being exported. Click on Save As. This will display the Save As dialog box. After exporting the data as a LandXML file, you can import it into GeoHECRAS. 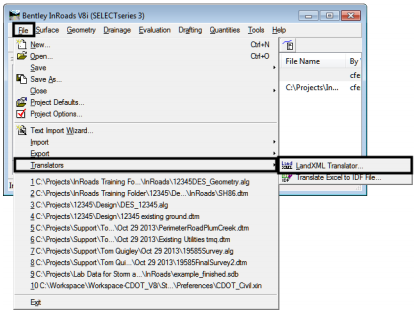 Review this knowledge base article on how to import a LandXML file into GeoHECRAS. To import terrain surfaces from Bentley GEOPAK, you have to first export the surface to LandXML format. You have the option to export design data of two types: DTM (terrain surface) and Geometry Data. If your DTM is in a TIN format, then you can directly export the DTM to a LandXML file. Otherwise, you will need to create a TIN before exporting. From the GEOPAK Applications menu, choose GEOPAK ROAD and select DTM Tools. From the menu bar, select DTM Menu. 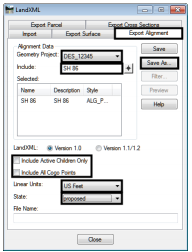 From the DTM menu, open the Utilities menu and select Export LandXML. 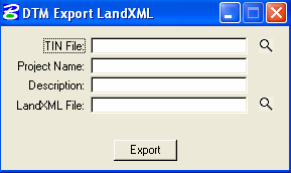 The DTM Export LandXML dialog box will appear. TIN File: Click the magnifying glass to browse to the TIN to be exported. Project Name: Enter a Project Name and Description. It should be Complete 11 digit FPID#. Remember that this name will be further exported to the LandXML file. English Unit: Options are available for US Survey Feet and International feet. Choose US Survey Feet. 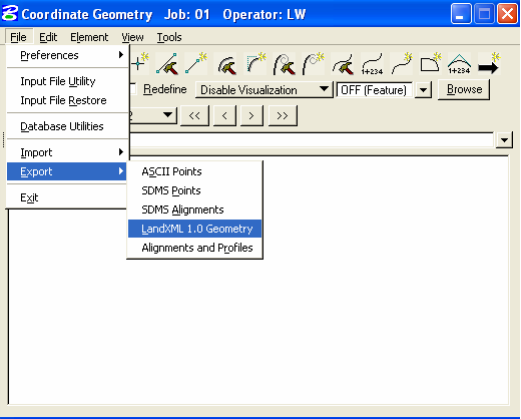 Open the GEOPAK Coordinate Geometry dialog, then select File > Export > LandXML 1.0 Geometry. 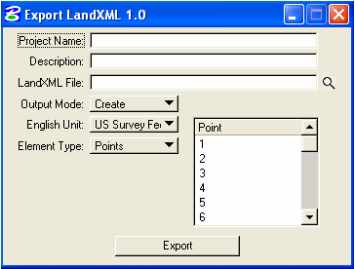 The Export LandXML 1.0 dialog box will appear. If you need assistance on importing MicroStation Surfaces into GeoHECRAS issue, feel free to contact our technical support team. They will be glad to assist you.